Crowdfunding to raise equity for real estate development is well underway in the U.S. Not so much in Canada until this week. NexusCrowd Inc. announced Wednesday it has closed the country’s first online investment offering for commercial real estate. The Toronto-based business raised $500,000 from “10s” of accredited investors to be partial backers of a $100-million retail mall near the northeast corner of Dixie and Dundas in Mississauga, Ont. Hitesh Rathod, co-founder and CEO of NexusCrowd, hit upon crowdfunding for real estate a few years ago while working on equity financing for an agriculture company through the private markets. “I quickly realized how difficult it is to raise capital from the equity-raising side and as an investor to get access to really good deals,” he said. Putting on his investor hat, Rathod, who has an investment banking background with Mackie Research Capital and Canaccord Genuity Inc. (CF-T), sought to create a funding platform that would not load up small investors with big risks. “How can I mitigate a lot of the risks that are involved in private market investing and crowdfunding specifically?” he explained. In the U.S., crowdfunding has raised more than US$208 million over the last two years, according to a Reuters report this week. NexusCrowd has created a limited partnership into which the individual investors’ money was placed and that partnership invested directly in the development project. The NexusCrowd founder was referring to the equity company’s low-low minimum investment of $10,000. That compares favourably to the $100,000 to $150,000 demanded from accredited investors in typical real estate equity investments, he said. NexusCrowd, which obtained its exempt market dealer license from the Ontario Securities Commission in July, had examined “north of five” potential real estate investments before it decided to go ahead with the Mississauga investment. “Each developer or private equity firm will show us all the transactions that they are going to make and we only pick the ones we believe will be most attractive to our investors before posting them,” said Aris Economopoulos, vice-president of operations with the crowdfunding company. “In addition to that, we put both the developer and the individual investment opportunity through a due diligence process. The retail mall development marking NexusCrowd’s first real estate investment deal is on the site of a former used car dealership in Mississauga and is now vacant. It is across the street from two big box retailers: Walmart and Costco. 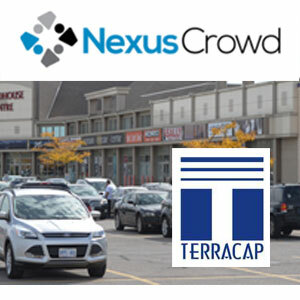 NexusCrowd’s institutional partner, Terracap Investments Inc., has more than 30 years of commercial real estate development experience across North America and expects to finish construction of the project by the end of 2017. The 238,000-square-foot two-storey mall will be anchored by a Tier 1 bank and a large supermarket. Once the retail mall is built, NexusCrowd will liquidate the position. As for the payback for investors? “I can’t go into the respective returns, but what I will say is every deal that we target in the real estate space should provide, or the expectation is they will provide, anywhere between 15 and 25% IRRs,” said Rathod. NexusCrowd said it is currently working on its second crowdfunding deal that it expects to announce soon.